Our journey through the Book of Esther picks up with Chapter D (as The New American Bible labels it), which embellishes upon and replaces 5:1-2. Queen Esther enters the presence of King Ahasuerus. Perhaps she is manipulative in showing great deference to him, as to win his favor, but we can forgive her that, given the circumstances, which is to say, the possibility of execution. The monarch is tender toward her and grants her whatever she wishes, which is a banquet the next day with Haman present. 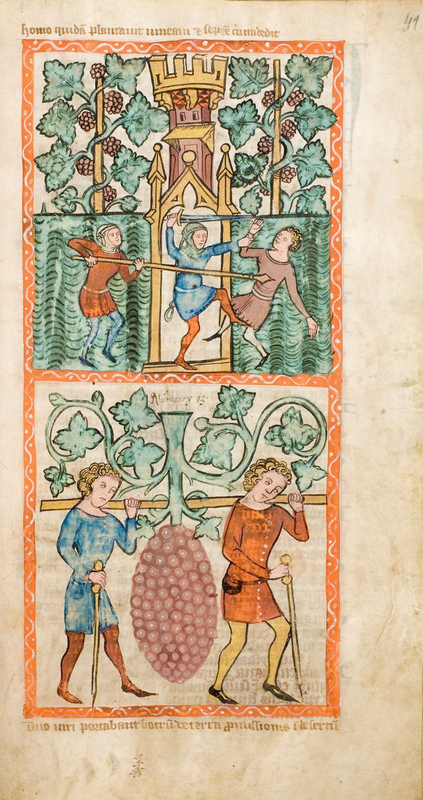 Haman, meanwhile, continues to plot against Mordecai and has an impaling stake (for Mordecai’s execution) erected. Haman is indeed one who, in the words of Psalm 55, has enmity in his heart. The advice from Colossians to seek “the things that are above” is always appropriate. Certainly placing one’s life at risk for the benefit of others falls into that category. It is a courageous act, one that requires selfless love. There is no higher love than to lay down one’s life for another or for others (John 15:13). To risk doing that is close enough to that standard for that category, at least in my thinking. I read the story of Esther in Chapters D and 5 then ask myself what I might have done in her situation. I might have chosen the easy way out and laid low. After all, who wants to die by being impaled on a stake? The story convicts the great mass of us of our moral cowardice. FYI: Daniel 4:1-37 in Protestant Bibles equals Daniel 4:1-34 in Jewish, Roman Catholic, and Eastern Orthodox translations. To be fair, some people I have known have nurtured my intellectual arrogance via their lack of intellectual curiosity and their embrace of anti-intellectualism. That reality, however, does nothing to negate the spiritual problem. I am glad to report, however, that it is a subsiding problem, by grace. The internal chronology of the Book of Daniel defies historical accuracy; I came to understand that fact years ago via close study of the text. The Book of Daniel is folkloric and theological, not historical and theological. 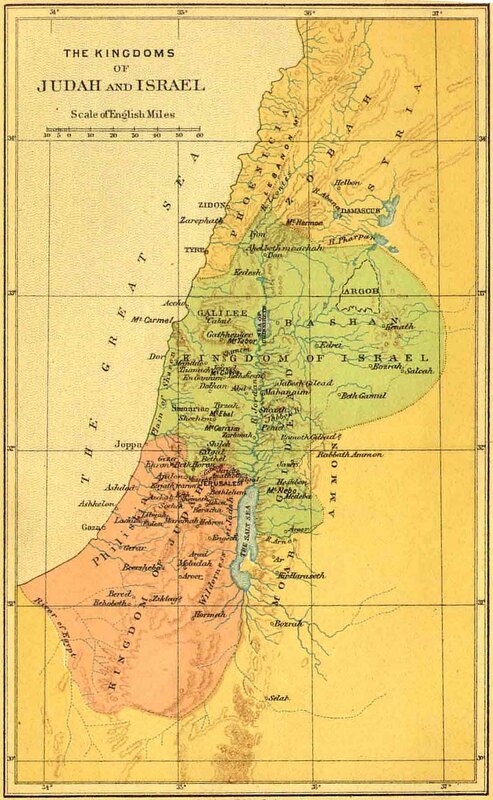 The folktale for these three days concerns King Nebuchadrezzar II (a.k.a. Nebuchadnezzar II), King of the Chaldean/Neo-Babylonian Empire, who reigned from 605 to 562 B.C.E. The arrogant monarch, the story tells us, fell into insanity. Then he humbled himself before God, who restored the king’s reason. So now I, Nebuchadnezzar, praise, exalt, and glorify the King of Heaven, all of whose works are just and whose ways are right, and who is able to humble those who behave arrogantly. This is folklore, not history, but the lesson regarding the folly of arrogance is true. The Parable of the Wicked Tenants (Mark 12:1-12) exists in the context of conflict between Jesus and Temple authorities during the days immediately prior to his death. In Chapter 11 our Lord and Savior cleansed the Temple and, in a symbolic act, cursed a fig tree as a sign of his rejection of the Temple system. In Chapters 11 and 12 Temple authorities attempted to entrap Jesus in his words. He evaded the traps and ensnared his opponents instead. In this context Jesus told the Parable of the Wicked Tenants. The vineyard was Israel, the slain slaves/servants were prophets, and the beloved son was Jesus. The tenants were the religious leaders in Jerusalem. They sought that which belonged to God, for Christ was the heir to the vineyard. Faithful people of God, however, are to live differently, pursuing righteousness, godliness, faith, love, endurance, and gentleness (verse 11). The wealthy are to avoid haughtiness and reliance on uncertain riches, and to trust entirely in God (verse 17). Further instructions for them include being generous and engaging in good works (verse 18). Complete dependence upon God is a Biblical lesson from both Testaments. It is a pillar of the Law of Moses, for example, and one finds it in 1 Timothy 6, among many other parts of the New Testament. Colossians 2:6-15 drives the point home further, reminding us that Christ has cancelled the debt of sin. Forgiveness as the cancellation of debt reminds me of the Parable of the Unforgiving Servant (Matthew 18:23-35). A king forgave a large debt–10,000 talents–a servant owed to him. Given that one talent was fifteen years’ worth of wages for a laborer, and that the debt was therefore 150,000 years’ worth of wages, the amount of the debt was hyperbolic. The point of the hyperbole in the parable was that the debt was impossible to repay. The king was merciful, however. Unfortunately, the servant refused to forgive debts other people owed to him, so the king revoked the debt forgiveness and sent the servant to prison. So my heavenly Father will also do to every one of you, if you do not forgive your brother or sister from your heart. Just as God forgives us, we have a responsibility to forgive others. Doing so might require us to lay aside illusions of self-importance. That has proven true in my life. all good counsels, and all just works. and those who turn their hearts to you. that your glory may dwell in our land. and peace shall be a pathway for your feet. The hope which Psalm 85:8-13 expressed seemed far removed from reality. Turning to the pericopes from the New Testament, St. Paul the Apostle, St. Mary of Nazareth, and St. John the Baptist lived up to their responsibilities. 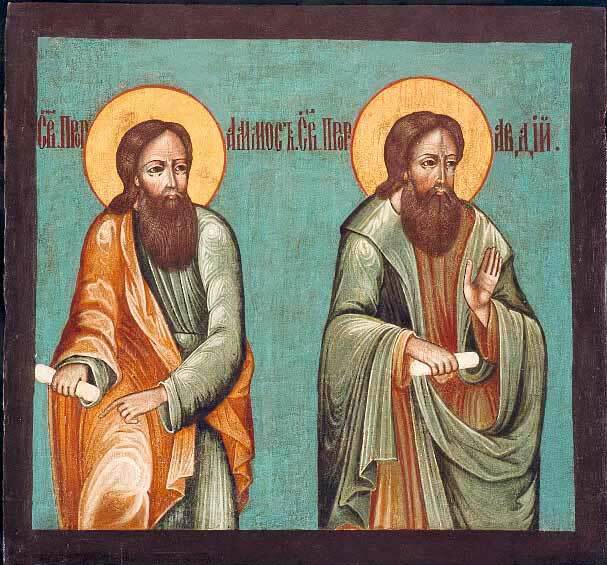 St. Paul (who might have even written or dictated the Letter to the Colossians) and St. John the Baptist gave their lives for God. Our Blessed Mother raised the Son of God properly with the able help of St. Joseph and experienced great heartache prior to her Assumption into Heaven. The call of God, with all its responsibilities, carries great risks, joys, sorrows, and rewards. I, as a Christian, follow Jesus, who gave everything. Dare I shirk my responsibilities and offer excuses instead? Beloved God, from you come all things that are good. The reading for these three days overlap nicely, focusing on the themes of idolatry and apostasy. To commit apostasy is to fall away from grace. (Thus grace is not irresistible. Strict Calvinism is therefore mistaken about that fifth of the TULIP formula. I am also dubious of the Perseverance of the Saints, which relates to Irresistible Grace.) An idol is anything which takes the place of God in one’s life. Thus an idol might be a false deity, an activity, or even a sacred text. Function in one’s life determines that thing’s status relative to idolatry. Among the most popular idols is the Bible, which is supposed to function instead as an icon–through which people see God. But, if one treats it as an idol, that is what it is for that person. The lessons from Jeremiah condemn idolatry which has led to national apostasy, evident in ill-advised alliances with foreign, predatory empires. and your apostasies will convict you. From the gloom of Jeremiah 2 and 6 we turn to the Pauline tradition, which emphasizes Christ crucified and resurrected. St. Paul the Apostle rejects, among other things, Gnostic asceticism, a form of Jewish ritualism, and the practice of worshiping angels as methods as obtaining the spiritual upper hand. Christ is sufficient, the ever-Jewish Paul tells us through the ages. I understand the Apostle’s objection to Gnosticism, with its reliance on secret knowledge and belief that matter is evil. If salvation comes from having secret knowledge, as Gnostics insisted, the death and resurrection of Jesus were pointless. In fact, in Gnostic thought, he did not die because he was not even corporeal, for, in Gnosticism, he could not have had a body, a body being material and therefore evil. Thus Gnosticism was not Christian. The exclusion of Gnostic texts from the Bible was not, as some “documentaries” on the History Channel claim, a conspiracy of Church leaders to suppress truth and crush dissent. No, it was a proper course of action. As for rituals (especially Jewish ones), I approach the text from Colossians differently than do the authors of some of the commentaries I consulted. A high proportion of these writers were Presbyterians with little use for ritual. Their paragraphs screamed between the lines “This is why I am not a Papist!” I, as an Episcopalian, know the value of ritual and of approaching it properly. It should be an icon, not an idol, although it functions as the latter for many people. But so does the Bible, and I do not heap scorn on that sacred anthology either. Apostasy, a theme from the Jeremiah readings, recurs in John 7. Temple officials accuse some Temple policemen of it for refusing to arrest Jesus, who had impressed them. These officials also accuse Nicodemus of the same offense. I realize that much of the Gospel of John reflects late first-century C.E. Jewish Christian invective, for Jewish Christians had found themselves marginalized within Judaism. Nevertheless, the stories in John 7:40-52 have the ring of truth, for fearful people in positions of power have attempted to retain it in many places and at numerous times. Idols come in many varieties, shapes, sizes, and ages. As I have written in this post, function in one’s life determines status relative to idolatry in that life. Among the more common idols is attachment to the status quo ante, especially if one benefits from it. Thus we become upset when God does something we do not expect. This might threaten just our sense of order (hardly a minor issue), but also our identity (also a major consideration) and socio-economic-political or socio-economic standing (of which we tend to be quite protective). But when was religion supposed to function as a defense against God? 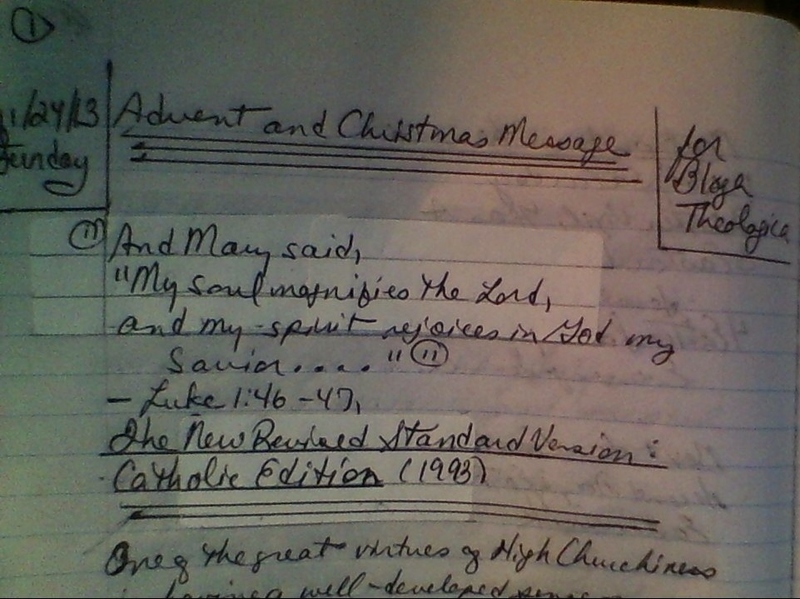 and my spirit rejoices in God my Savior…. One of the great virtues of High Churchmanship is having a well-developed sense of sacred time. So, for example, the church calendars, with their cycles, tell us of salvation history. We focus on one part of the narrative at a time. Much of Protestantism, formed in rebellion against Medieval Roman Catholic excesses and errors, has thrown the proverbial baby out with the equally proverbial bath water, rejecting or minimizing improperly the sacred power of rituals and holy days. We attach no holy significance to the day. There is no warrant for the observance of Christmas and Easter as holy days, but rather contrary (see Galatians iv.9-11; Colossians ii.16-21), and such observance is contrary to the principles of the Reformed faith, conducive to will-worship, and not in harmony with the simplicity of the gospel in Jesus Christ. It is not hard to see in this radical Protestant perspective a religious source for the very secularization of the holiday that would eventually be so widely decried. With the often jostling secularism of the Christmas bazaar, Protestant rigorists simply got what they had long wished for–Christmas as one more market day, a profane time or work and trade. due to the concentrated holiday season in December. This is about succinctness and respect in my mind; I am not a culture warrior. Yet I cannot help but notice with dismay the increasingly early start of the end-of-year shopping season. More retailers will open earlier on Thanksgiving Day this year. Many stores display Christmas decorations before Halloween. These are examples of worshiping at the high altar of the Almighty Dollar. I refuse to participate in this. In fact, I have completed my Christmas shopping–such as it was–mostly at thrift stores. One problem with materialism is that it ignores a basic fact: If I acquire an item, I must put it somewhere. But what if I enjoy open space? I encourage a different approach to the end of the year: drop out quietly (or never opt in) and keep nearly four weeks of Advent and all twelve days of Christmas. I invite you, O reader, to observe these holy seasons and to discover riches and treasures better than anything on sale on Black Friday.